Gap presents its 2013 Spring/Summer collection. The result is a burst of bold and bright shades, hot pink, neon yellow, mint green, mixed with large prints and delicate fabrics. A pure celebration of the 80s. But what is the secret to wear these extreme colours without appearing too frivolous? Simple, mix them with neutral shades to create a mish mash of textures and designs. Tone down neon colours using kaki and white denim or grey melange for a day-at-the-office look. Or use a combination of black & white to create a game of optical illusion. If you love denim, Gap has injected a splash of colour in your everyday favourites. Light indigo to mix and blend with lilac elements perfectly match with white and broderie shirts, to infuse a delicate touch to a casual afternoon look. The new season is all about floral and animal prints and eighty inspired accessories to create a flamboyant look. Neon yellow shoes, bright pink bags and two-toned patterns are next season must have! If you love the colours but you don’t feel in the holiday mood, pull out the look with a monochrome cardigan or neutral shades chinos. 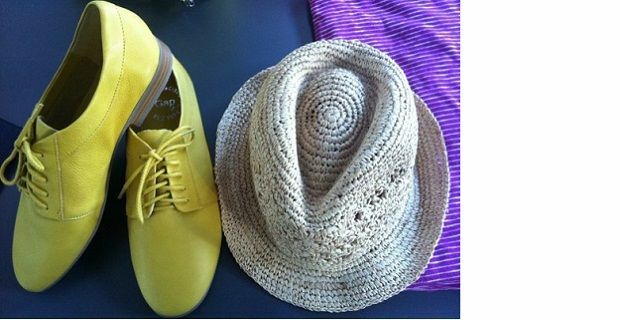 The hottest accessories of the season are fluoro brogues and woven bucket hats, make sure you wear them extensively! Let’s not forget Gap signature pattern, classic stripes. We like them on knitwear and t-shirts, we like them small and elegant or big and bold, we love them navy-style...we simply can’t get enough of them! Have you been to Baby Gap, UK?